Pearls Elite™ / 30 caps - Nature's Way®. Pearls Elite™ probiotics aren’t bigger; they’re smarter! Plus they’re small, easy to swallow and don’t require refrigeration so you can take them anywhere, anytime. Take 1 softgel daily. May be taken with or without food. Do not chew or crush. If taking any medications, consult a healthcare professional before use. Keep out of reach of children. 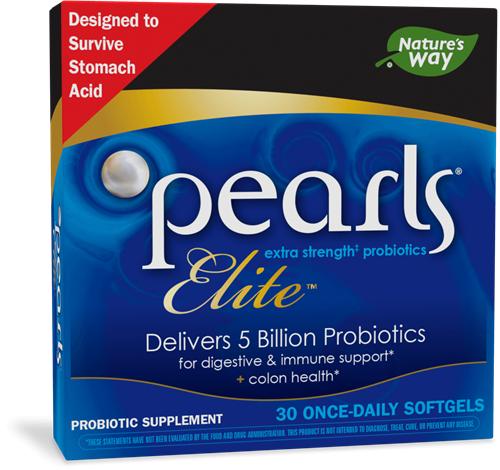 ‡Pearls Elite™ offers 5 times the potency compared to Probiotic Pearls™ Acidophilus. Bl-04® is a trademark of DuPont. In the USA, NCFM® is a trademark of the North Carolina Agriculture Foundation, Inc. NCFM® and Bl-04® are used under license. Does it matter when I take Pearls Elite? Contains milk, fish (Tilapia), and soy.